Just as it is impossible to understand the American religious landscape without some familiarity with evangelicalism, one cannot grasp the shape of contemporary Christian ethics without knowing the contributions of evangelical Protestants. This newest addition to the Library of Theological Ethics series begins by examining the core dynamic with which all evangelical ethics grapples: belief in an authoritative, inspired, and unchanging biblical text on the one hand, and engagement with a rapidly evolving and increasingly post- Christian culture on the other. It explores the different roles that scholars and popular figures have played in forming evangelicals' understandings of Christian ethics. And it draws together the contributions of both senior and emerging figures in painting a portrait of this diverse, vibrant, and challenging theological and ethical tradition. This book represents the breadth of evangelical ethical voices, demonstrating that evangelical ethics involves nuance and theological insight that far transcend any political agenda. Contributors include David P. Gushee, Carl F. H. Henry, Jennifer McBride, Stephen Charles Mott, William E. Pannell, John Perkins, Soong-Chan Rah, Gabriel Salguero, Francis Schaeffer, Ron Sider, Helene Slessarev-Jamir, Glen H. Stassen, Eldin Villafañe, Allen Verhey, Jim Wallis, Nicholas Wolterstorff, and John Howard Yoder. The Library of Theological Ethics series focuses on what it means to think theologically and ethically. It presents a selection of important, and otherwise unavailable, texts—English- language texts and translations that have fallen out of print, new translations, and collections of significant statements about problems and themes of special importance—in an easily accessible form. This series enables sustained dialogue on new and classic works in the field. "Focusing on the reemergence of an evangelical social conscience in the United States since World War II, this Reader will serve as a vital reference point for naming and framing how this fissiparous and influential part of the American religious landscape has thought about the proper ordering of social and political relations. For the growing body of evangelicals committed to 'making a difference' in the world, this text is a key resource for understanding their own intellectual inheritance. For external observers, the book will dispel often unexamined assumptions about all evangelicals having atavistic, theocratic tendencies." 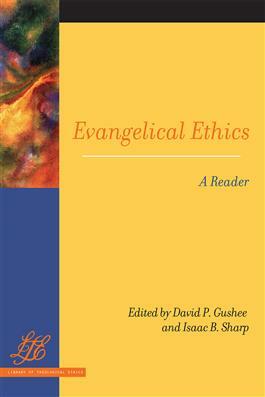 "Evangelical Ethics: A Reader offers an important window into the breadth and variety of evangelical voices speaking on a number of issues. For those who may think evangelicals are narrow and parochial in moral emphases, the chapters in this volume will be a delightful surprise. The contributors open up our moral horizons by addressing a variety of social ethical issues, such as race, nationalism, poverty, social justice, and immigration, informed by ways of reading Scripture, and engaging in theological reflection, with important implications for social ethical engagement for all Christians. This volume is a welcomed addition to the Library of Theological Ethics." "Nonevangelicals will gain great insight and some surprises from Evangelical Ethics-if they think of evangelical Christians as the conservative white culture-warriors of the Christian right. To the contrary, Gushee and Sharp present us with powerful voices, going back to the nineteenth century, who espouse progressive cultural reform and social activism on behalf of the gospel. These include Baptist, Anabaptist, Mennonite, Wesleyan, black, and even feminist stances. This book does more than advance evangelical history; it surfaces an important strand of American social ethics, familiarity with which is essential to an informed and effective Christian politics today."